CWCM Members can receive 50% back in cash, or credit towards a birthday party or gift shop purchase. Or, you can simply choose to generously donate the TOTAL amount to CWCM! Sizes: With a focus on clothing for infants, toddlers, children up to 10 years old & expecting moms, we'll accept items for all ages! Age range: With a focus on items for infants, toddlers, and children up to 10 years old, we'll accept donations for all ages! Types: Educational, interactive, motor skills, board games, Legos, action figures, bikes, wagons, sports equipment, books, DVDs, handheld games, etc. Strollers, child proofing items, nightstands, desks, guitars, violins, etc. Have something not listed above and wondering if we will accept it? Call us today at (715)344-2003! We ask that items be either in new, very good or gently used condition. Please launder clothing, clean toys and ensure all parts needed for item use are included. Items we cannot accept for resale for safety reasons include, but is not limited to cribs, car seats and safety gates. CWCM reserves the right to refuse all items we deem in unacceptable condition or unsafe for resale. If you would like a receipt please provide your name, address, and other information at time of donation. 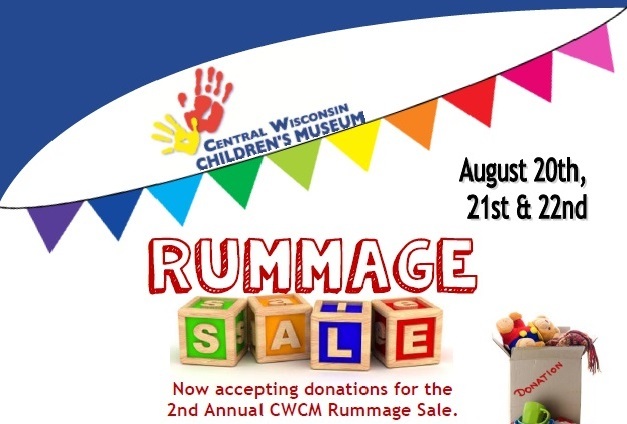 And remember, CWCM Members can receive 50% back in cash, or credit towards a birthday party or gift shop purchase! You can also choose to generously donate the TOTAL amount to CWCM! Your donation ensures others can Explore new items, Discover new possibilities and Create new wardrobes and new experiences!